Is Lousiville star quarterback Lamar Jackson NFL-ready? Despite being the youngest player ever to win the Heisman Trophy, some critics are continuing to doubt Lamar Jackson’s NFL potential. An abundance of fans have already dubbed Lamar Jackson as the next great dual-threat quarterback poised for NFL success. His accomplishments at Louisville have certainly warranted such talk; after all, he did win the Heisman Trophy at the age of 19. After a less-than-ideal performance against Clemson, NFL scouts and executives are beginning to weigh-in on Jackson’s NFL future. There are legitimate holes in Jackson’s game and they aren’t exactly tough to find. To some of those who believe that Jackson won’t succeed at the next level, his big numbers are due to his “easy opponents”. Although Louisville doesn’t play in the SEC, amongst some of the countries toughest defenses, to say Jackson’s stats have been bolstered due to playing mediocre programs is irrelevant. A more fair assessment would be to say that the defenses that Jackson has faced have lacked NFL-ready talent. With the exception of a couple programs, that’s a fair comment. Most of the damage that Jackson has done to opposing teams has been with his legs. Only six-times in the last two seasons has Jackson been held to under 100 yards rushing. Even then, three of the teams that contained Jackson’s rushing attack were punished through the air (Marshall, NC State, Virginia). Only Houston, Clemson and LSU have been able to successfully contain Jackson in both areas. All things considered, LSU and Clemson have NFL-ready talent spread across their defenses. Houston has only one sure-fire NFL talent (Ed Oliver). Therefore, Jackson has struggled on big stages against NFL-caliber competition. During the Citrus Bowl, LSU was able to make Jackson’s Heisman look like a fluke. 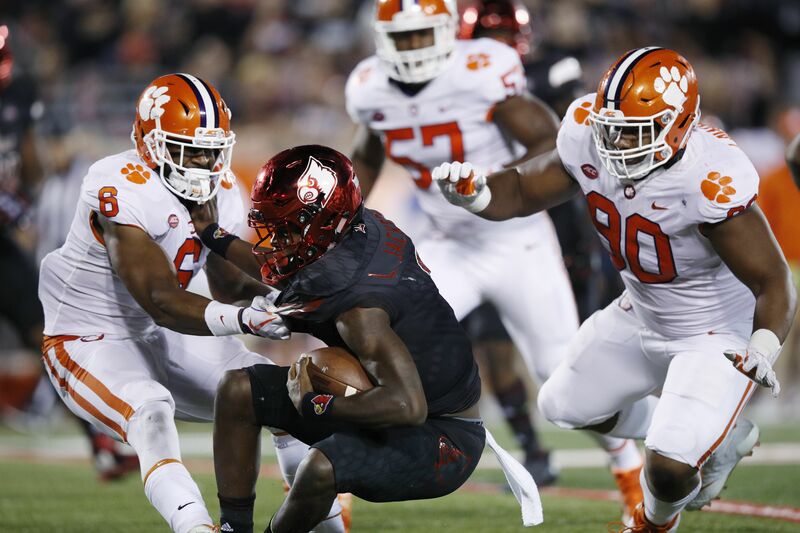 The Tigers defense kept the Heisman winner out of the end-zone, as he went 10-for-27 passing with 153 yards. Additionally, he carried the ball 26 times for a mere 33 yards. Although Clemson was unable to hold Jackson to such mediocre numbers in Week 3 of the 2017 season, the Tigers limited Jackson’s big play ability enough to win. Despite racking up 317 yards through the air and three touchdowns, Jackson was held to just 64 yards rushing, with almost half of those coming on his 30-yard scamper in the first quarter. When tasked with taking on some of the league’s toughest and most adept defenses, Jackson has struggled immensely. Another problem Jackson faces is his inaccurate arm. Throughout his three-year career at Louisville, No. 8 has managed to complete over 70 percent of his passes in just three games (not counting his 1-for-1 passing performance against Clemson in 2015). While it is true that Jackson’s completion percentages no longer dip as low as the 30-40 percent range, as they did his freshman year, they are still incredibly low. For such an elite talent, Jackson’s completion percentage should linger around the upper 60’s, as opposed to where it is now. Before the Clemson game, Jackson’s accuracy looked to have been getting better. However, let’s wait until the season is over to assess his progression as an accurate quarterback. Finally, Jackson struggles with turnovers. Jackson has turned the ball over by virtue of an interception or lost fumble in all but eight of his 26 games played (once again excluding 2015 Clemson game). This statistic is alarming. Luckily for Jackson, when it rains, it doesn’t pour. He has very few career multi-interception and no multi-fumble (fumbles lost) games. Overall, Jackson does not look as NFL-ready as some like to believe. There are obvious flaws in his game. Not to mention, dual-threat quarterbacks such as Jackson seldom succeed in the NFL. His elusiveness and playmaking ability may see him move to a slot receiver or running back-receiver hybrid in the NFL. However, there’s absolutely no telling whether or not Jackson will succeed in the NFL. Only time will tell. For now, his focus is surely on rebounding from the Clemson loss and maybe even defending his Heisman Trophy.